With lots of media coverage of adoption and the release of BASW's report on the role of the social worker in Adoption and then the comments on reports from various trusted and influential voices I find myself wondering who's voice we should be listening too. I liked the report, understood its scope and focus and saw no 'hidden agenda' but I'm left wondering how we, the stakeholders, of adoption sift the range of views that are presented to us? Who's voice is the authentic definitive voice on adoption, who can I trust and believe? Is it that all voices come with bias and vested interests that may or may not be apparent? So, is there one voice that can be weighed as the 'right voice'. Can we listen voices out of context? The more I think about it the more opaque it becomes, we talk of the members of the adoption triangle but they are in fact overlaid by the social care, legal system and political system, a triangle within the grip of larger forces. Even writing this I'm conscious of my own vested interests, father to adopted children, social worker, adoption blogger, I've gained children from the adoption system but I've seen my children lose siblings to the adoption system and I've walked my own path. My voice has to be weighed like all others. So, my question is this, who are the guardians of the adoption system? The motivations of all are viewed with suspicion by someone in the triangle. Is it that the Government wants to save money and garner votes, adoption is a convenient solution. Judges are more concerned with law than lives; Judges are set against birth families or adopters or everyone. Social workers are in the pocket of the government working to 'targets' pulling children into the system or they're too concerned with parents rights and holding children back. Adopters want to travel the system with as little friction as possible and collect children as soon as possible, Adopters are a cheap way of saving money. Birth parents don't deserve a say and of course they're against adoption. 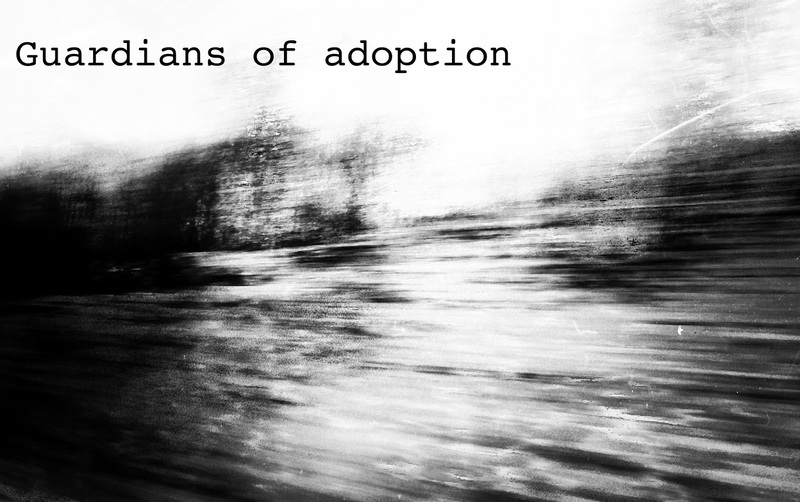 I'm overstating for affect but they're all words I've heard, I don't agree with them, but they are reflections on how the members of the adoption community perceive each other. Entrenched views that sometimes defy evidence set before us. Yet always, adoptees remain the silent common denominator, everybody wants them but we're not so quick to hear them. Who do we listen too, are all stakeholder's voices filtered through their experience and inherent position? Many participants see a need for change and evolution of the system but our end goals are perhaps in competition. We also disagree on what needs to be changed and how to change it. Everyone has their views. As a society we've decided that adoption is the vehicle that we are going to use to care for some of the most vulnerable and harmed children in our society when they cannot be cared for by their parents. However, it seems that society prefers to see adoption in binary terms, shocked by the scandalous injustices of tabloid headlines. 'Overweight prospective adopter refused children' and 'social worker makes terrible forced adoption error' and scream the papers but remain indifferent to the contemporary reality and challenges children face. We need voices of reason and balance because the stakes are high, adoption touches all who come into it's sphere in the most primal sense, it's our children, biological or joined, our soul, our future and past. We can't fall into the binary traps of adopter good birth family bad. Can we trust politicians, or adoptees, or lawyers, or professors or mothers and fathers? Yes and no. We need voices of peace, reconciliation and reason. We need clarity of thought and hope. We need to talk of the financial and moral cost of adoption and of human rights. We need to be honest about crime and punishment, hope and redemption. We need to be rational, reasoned and reasonable. We need to consider the needs of children. That all said, is the prevailing wind seems set against adoption in its current form? If so we need to be open to listen to others with open minds and willing to embrace views that may not be ours.